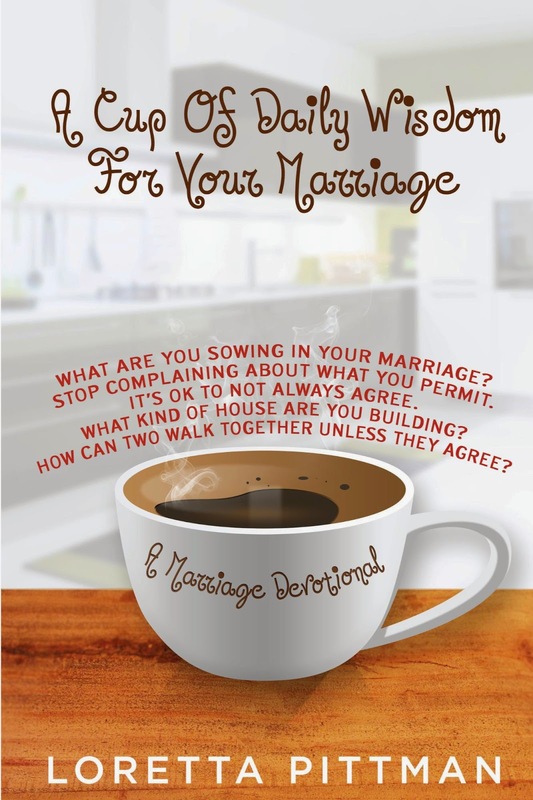 Today we are interviewing Loretta Pittman, author of A Cup Of Daily Wisdom For Your Marriage (A Marriage Devotional). well I have been married for 27 years to my awesome husband and we have 4 grown children. I'm a pastor in my church and I'm studying for my Masters in Christian Counseling and Bachelors in Christian Education. Describe the purpose of your book in a few sentences? The purpose is to let couples know it's hard to become one with your spouse without God. You need God in your marriage to succeed and to have a long lasting marriage. What inspired you to write this book ? My husband was my true inspiration I really struggled to understand him and to become one with him but God helped me truly understand him, you see God knows my husband better than me and now I truly love him. As a biblically based book how does your book differ from other books on marriage? My book differs in the sense that it makes you think about what you do and say to your spouse. Wisdom is the only problem you have . I believe that it will impact peoples intellect when it comes to what they say and do. I also believe it will inspire people to change and allow God in their marriages. We can do all things through Christ who strengthens me. Yes let God guide you learn to have a relationship with God first and trust him to change your life, spouse and family he can do anything if we just trust him.